Using advanced technology, Freud developed the LU79 thin kerf line of saw blades that features laser-cut, anti-vibration slots that practically eliminate the vibrations that resonate in standard blades. 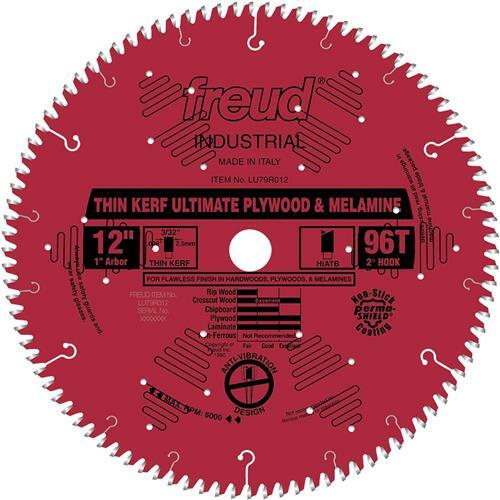 This blade provides flawless, chip-free edges in veneered plywoods, fine moldings, melamine, laminates, and crosscuts in solid woods. The combination of Hi-ATB tooth design and anti-vibration slots makes these thin kerf blades the ultimate finish blades. The result is a cut so smooth it eliminates the need for a stabilizer or a scoring blade!